» Is sleeping on the couch good for your health? You Must Not Be So Sure. Is sleeping on the couch good for your health? You Must Not Be So Sure. Maybe this scenario sounds familiar to you: You've settled onto your couch in front of the telly to spend a quiet Friday evening watching back-to-back reruns of your favorite show. There is salty chips and soda on the coffee table in front of you and a comfy cozy throw to keep your toes warm. As the evening progresses you gradually shift from a sitting position to reclining on your side with your head propped up on your hand to lying flat out on your couch, head on the armrest. Before you know it, it's morning and you've got a stiff back, a painful neck, and a groggy head. You realize you just slept through the night on the couch. We've all done this at one time or another. Sleeping on the couch is pretty common. Sometimes it may not be by choice – you could be crashing at a friend's place, or being a gracious host and allowing a guest to take your bed. Every once in a while is not that big a deal but watch that it doesn't turn into a regular occurrence because it comes with a number of negative effects on your health. You'll notice that the majority of these are related to the improper sleeping positions you are forced to assume on a couch. You may not realize it (especially if you're on the shorter side like me) but most couches aren't long enough to accommodate the average person's body comfortably. This means you can't stretch your legs and back completely but will have to sleep curled up the whole night. The result is a stiff and painful back when you wake up in the morning. The best ﻿throw pillows that support you so wonderfully while you're sitting on a sofa also unfortunately cut down the width of your sleeping area significantly. This limits free movement and stops you from turning over comfortably, which can reduce the quality of your sleep. There is also the chance that you will wake up on the floor in the morning, having rolled right off the couch at some point during the night. That is, unless you sleep like Dracula - straight on your back, with your arms folded over your chest. Urgh. We all know the terrible stiff neck that comes from sleeping with your head elevated at a too-high angle. This is certain to happen when you sleep on a couch and use the armrest as a pillow. The angle of your neck in this position is awkward and can cause a very painful crick – a sure way to ruin your day. The material a couch is stuffed with is usually unsuitable for the correct support and alignment your spine needs while you're sleeping. It's either too soft (the sort of couch you could sink into, and need help to get out of) - which can really mess up your spinal alignment - or too hard, which can give you sore and stiff muscles. Not many people think beyond the aesthetics of the upholstery (and the cost, of course) when buying a couch. The fact is, a fabric that feels fine when sat on for a few hours may not feel that good when you're sleeping on it for the night. It can range from too rough for comfort (like coarse, sturdy weaves which can leave imprints on your skin) to too smooth (like faux leather, which can make you feel sweaty after a bit). There's a reason why bed linens are made of breathable, soft material like cotton. 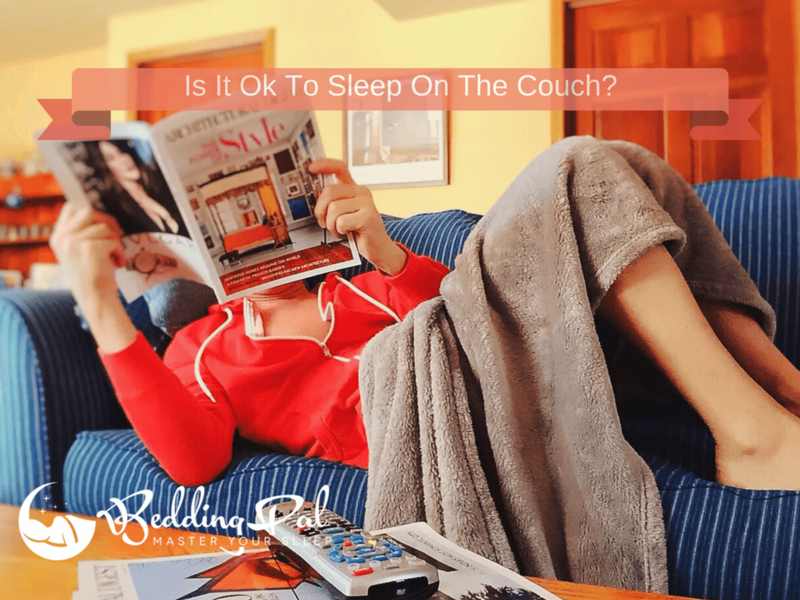 Bottom line: if the fabric of the couch's upholstery is uncomfortable, your quality of sleep will be compromised, guaranteeing that you'll be a grouch in the morning. Be honest. When was the last time you cleaned your sofa? And is there anything that couch hasn't retained a sample of? Food crumbs, drink stains, pet hair, probably body fluids (let's not get into that), dust, dirt, the list goes on. Even if it looks clean (because you chose a dark shade of upholstery so that grime wouldn't show so easily), it's a haven for dust mites and bacteria. You could end up sneezing endlessly, get a rash or in theory even fall sick from all the microscopic bugs that are lurking in there. So the next time you're tempted to just pull the throw over yourself and catch your Zs on the couch, stop, pick yourself up, change into your Pjs and tuck yourself into bed – your actual bed. It is easy to get tempted by sleeping on the couch while watching TV but it is one of the worst habit for your posture. Say no to sleeping or even laying on sofa and your body will thank you!